To begin, you will want to find the most accurate tire pressure gauge. These come in different kinds including digital and analog. Moreover, they also come in different shapes like a stick or dial. Stick gauges resemble a pin and are easy to store and use. Meanwhile, dial ones resemble a small clock, which makes the display easy to read. 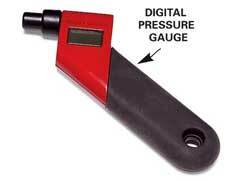 Lastly, a digital tire pressure gauge is the easiest to take and see a measurement, as it reads it back in big digital numbers. When searching for the most accurate tire pressure gauge it’s important to look for ones that require little maintenance, but offer long-term use. The best tire pressure gauges are the ones that are easy to clean, do not have to replace batteries often and can provide you with an accurate reading over a long period. With this in mind, Consumer Reports have done extensive testing to find the most accurate tire pressure gauge. Their findings show two Accutire digital gauges, models MS-4400B and MS-4021N performed the best. What’s great about these is you can find them at most department stores and automotive retailers. Additionally, they retail or $10.99 and $9.99 respectively, making them an affordable buy. Ultimately, finding the most accurate tire pressure gauge ensures you receive accurate readings every time. By picking up one of these models and testing your pressure at least once a month, it can help you maintain the proper air pressure in each tire, which will improve your handling, braking and fuel efficiency. Now it’s also important to note that some people may take additional steps to ensure their protection on the road. One way they accomplish this is by buying run flat tires. These allow drivers to continue to use them even if they have zero tire pressure. Typically, you would be able to drive on them up to a certain mileage. While they do add the convenience of not having to stop immediately to change your tire, durability has been an issue with them, and they can be very expensive to buy and fix. Therefore, the best way to ensure your safety on the road is to check your tire’s air pressure often.